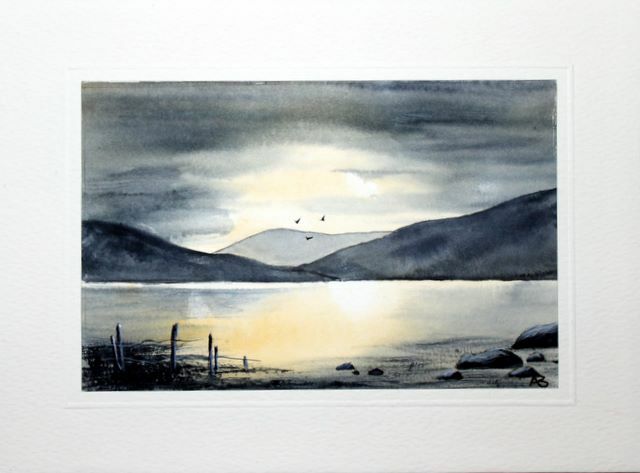 Wet in wet- is simply the process of applying pigment to wet paper. The results vary from soft undefined shapes to slightly blurred marks, depending on how wet the paper is. The wet in wet technique can be applied over existing washes provided the are thoroughly dry. Simply wet the paper with a large brush and paint into the dampness. The soft marks made by painting wet in wet are great for subtle background regions of your painting. Wet-in-wet watercolour painting can be tried by anyone who is willing to give up some control over their paint and let the colours flow up down and across the paper. The wet-into-wet approach is also a non-threatening introduction to watercolours for people of all ages who never tried to paint before. For more seasoned watercolour painters, the wet-into-wet approach can provide a well-needed break from a conventional watercolour painting. The wet-into-wet technique can be used to experiment with colours, paint flow, and water. It can also just be plain fun. Some watercolourists incorporate a wet-into-wet technique into small portions of a watercolour painting that uses different watercolour techniques. Materials used: A source of clean water - For this reason, the wet-into-wet watercolour painting technique is best practiced inside a studio, A good-quality watercolour paper - Wet-into-wet technique does not work too well on the average piece of paper. 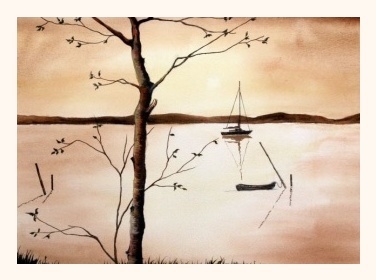 Use a piece of Bockingford or similar watercolour paper to achieve the correct effect. Watercolour paint - The brand, type and colour are all up to you. and colour are all up to you. Paint a rock using any and while wet, drop a another colour in to what will be the shadow areas. Paint the bottom of the rock using negative painting leaving grass shapes . Leave to dry. When the rocks are dry paint the cracks in the rock using a darker mix. Imagine the natural places where cracks would be and keep them generally going in the same direction. Using a mix of any blue and a Yellow , paint the area of grass in front of the rock. Start by lightly sweeping across the bottom of the rock in one stroke of the brush covering the grass painted in negative. It doesn't matter if some of the blades of grass are not completely covered, it adds to the effect and there you should have a wet in wet painting of a rock. Load a round brush with a green mix. Keep the brush fully loaded and apply the paint in a dragging motion using the belly of the brush across the paper. Try and create a random non symmetrical shape. Leave some white areas which will be gaps in the foliage and where the branches will be painted later. While the paint is still wet, drop in a darker green in what will be the shadow areas. 'Drop in' means: let the second colour flow out of the brush on its own into the first colour with little or no painting action. Now for the trunk of the tree. Using Burnt Sienna and Ultramarine mix, paint in the trunk and branches using a rigger brush while the tree is still wet that way the top of the trunk will merge with the green of the foliage. While the trunk is still damp, lift out some paint with a damp brush this will be a light area where the sun is shining. Lastly where you left the gaps in the foliage paint in some branches and there you have it a simple wet in wet tree.